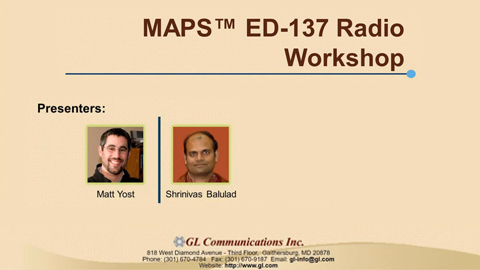 MAPS™ ED-137 Radio Software Ver 8.9.19 (64-bit Only) | Download Now! 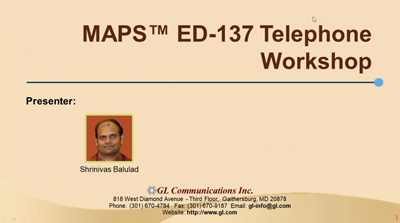 MAPS™ ED-137 Telephone Software Ver 8.3.19 (64-bit Only) | Download Now! MAPS™ ED-137 Recorder Software Ver 9.1.21 (64-bit Only)| Download Now! Voice communications for air traffic management, whether it is Air-Ground (A-G) or Ground-Ground (G-G) were predominantly over TDM based Air Traffic Management (ATM) networks. 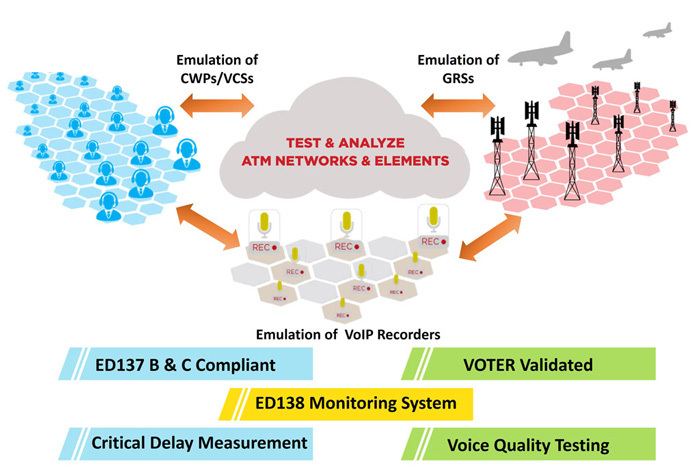 With the latest developments in EUROCAE (European Organization for Civil Aviation Equipment) ED-137 inter-operability standard, it is now possible to implement VoIP technology for voice services for air traffic control. 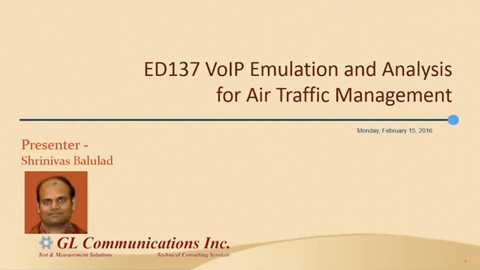 This implementation uses familiar SIP protocol to establish, modify, and terminate sessions within an Air Traffic Services Ground Voice Network (AGVN) with endpoint equipment. The endpoint equipment can be SIP based CWPs, Next Generation VCS, Radios, Recorders, and VCS/Radio Gateways allowing interworking with older legacy equipment and protocols as shown in the diagram above. Existing Voice Communication systems (VCS) systems can access an IP WAN network as the connection backbone using VoIP gateways. Before such a system is deployed live, it is imperative that thorough testing for voice quality, performance, reliability, and functionality be conducted. GL tools for signalling emulation and voice quality testing offer an end-to-end test solution for testing connections from the radio interfaces to the Controller Working Position (CWP). Measuring delay, jitter and packet loss through these networks is critical and network testers will need to precisely time events. Delay testing and verification is going to be particularly important with the transition to IP, which will introduce packetization delays as well as jitter buffer delays and other uncertainties. Understanding the time from which the Air Traffic Controller keys PTT until the IP stream indicates that the PTT bit is set is a relevant testing scenario. This delay measurement is possible using GL’s Audio Analyzer as well as GL’s Packet Analyzer. The above TM-ATM solution includes various GL test tools such as Audio Analyzer (which uses GL's VQuad™) and Packet Analyzer, TTL Signal Packetizer, Event Data Logger (all these three components use GL’s PacketExpert™- platform). All these components are controlled by a centralised component called MAPS™ Administrator (MA). MAPS™ Administrator calculates the time difference between posted events, i.e., Discrete Events (from the Packetizer) and Timed Events (from Packet Analyzer) and reports precise measured delay at different points in the network. All the components support client server model, with the MAPS™ Administrator acting as a client and controlling all the other components which act as servers, from a centralised location. Refer to Delay Measurements section for detailed information about the GL Test Tools used in the solution. 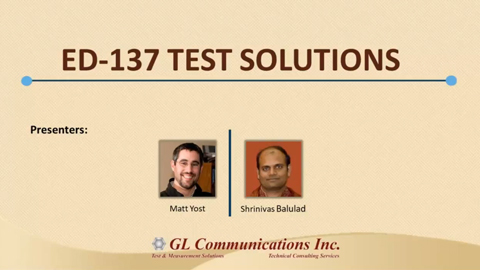 GL’s MAPS™ ED-137 address the need for additional testing needs that may include simulating many endpoints and generating bulk calls (load testing) on the network. 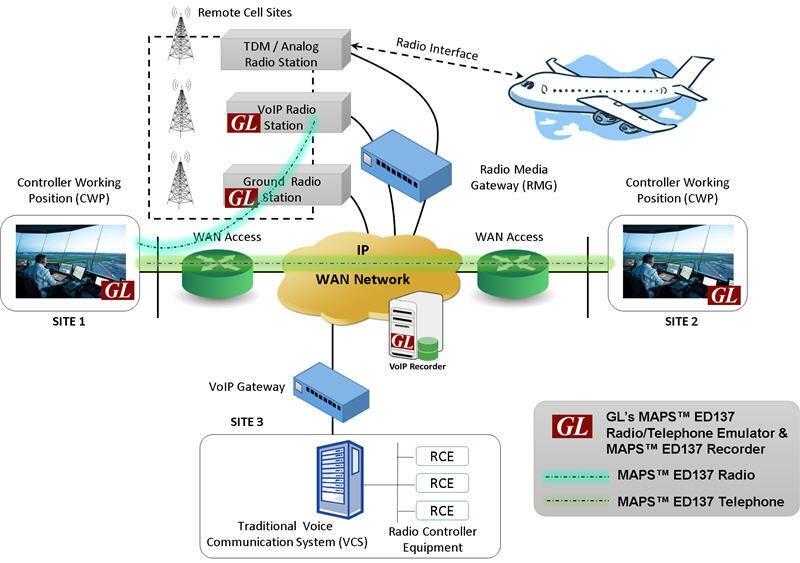 GL offers (Message Automation & Protocol Simulation) MAPS™, a software platform, which can simulate both Air-Ground calls (as per ED137_1B and ED137_1C: Radio) and Ground-Ground (as per ED137_2B: Telephone) calls as per EUROCAE (European Organization for Civil Aviation Equipment) ED137 standards. MAPS™ ED-137 support can emulate many user agents (end points) without requiring analog interfaces. The software also supports simulation of Recorder interface for both Air-to-Ground and Ground-to-Ground calls at CWP, GRS and Recorder endpoints as per ED-137/4B standards. Air Traffic Recorder is the next generation VoIP recorder implemented as per ED-137/4B inter-operability standards. Specially designed for all traffic control towers and centers to simplify the recording, archiving, and playback voice communications. 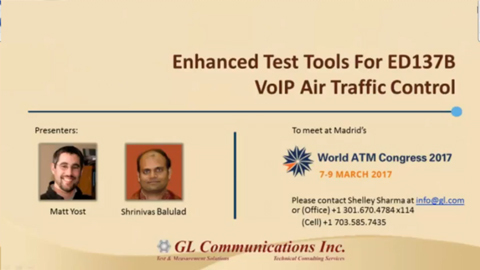 It can simulate AG/GG call recording towards Recorder and testing Recorder interface of CWP/VCS and GRS in ATM network. MAPS™ ED-137 VoIP ATM Telephone can simulate hundreds of Ground-to-Ground calls, supporting all Telephone call types and scenarios such as Call Hold and Call Transfer. MAPS™ ED137 VoIP ATM Radio can be configured as CWP and GRS to simulate outgoing and incoming messages in Air-to-Ground call. MAPS™ ED-137 Air Traffic Recorder can emulate call recording functionality at CWP, GRS and Recorder interfaces, generating more than hundreds of recording sessions to verify performance and load testing. MAPS™ ED137 can be used to set up voice sessions over a network, then send and record test voice signals for assessing voice quality and performance. It simulates both Controller Working Position and Radio Media Gateway System, with following important features required to maintain reliable communication over air traffic network. Supports RTP header extension format as per extended header type 0x167 (WG67). Both audio RTP and R2S packet will carry this 8 byte extended header. PTT and Squelch fields are set properly to signal voice activity in uplink or downlink. PTT-id assigned by remote end will be reflected in extended header. Supports generation of R2S-KeepAlive packets while there is no active voice being transmitted or received to keep the SIP session maintained. Push-To-Talk (PTT) and Squelch fields are reset properly to signal silence (idle period) in uplink and downlink respectively. R2S-Keep Alive Period: Maximum time (or frame interval) between each R2S-keep Alive packet. integer, in milliseconds. PTT ID: PTT identity (value from 000001 to max. number of possible RTP streams, e.g.111111=63) assigned to each user agent by GRS endpoint in 200OK response to INVITE. Version of the used RTP HE (Header Extension). Supports Additional SIP headers 'Priority' and 'Subject’. Every INVITE contains these two headers. Supports IP address spoofing to generate each SIP call using different IP address from a single system. For more details on MAPS™ ED-137, please visit MAPS™ ED-137 Telephone , MAPS™ ED137 Radio, MAPS™ ED-137 Recorder webpages. 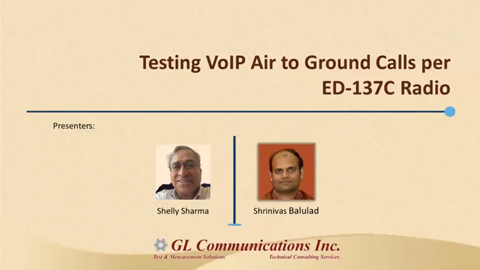 As discussed above, GL’s Testing Suites provides all the necessary flexibility and enhancements to meet the challenge of ED-137. 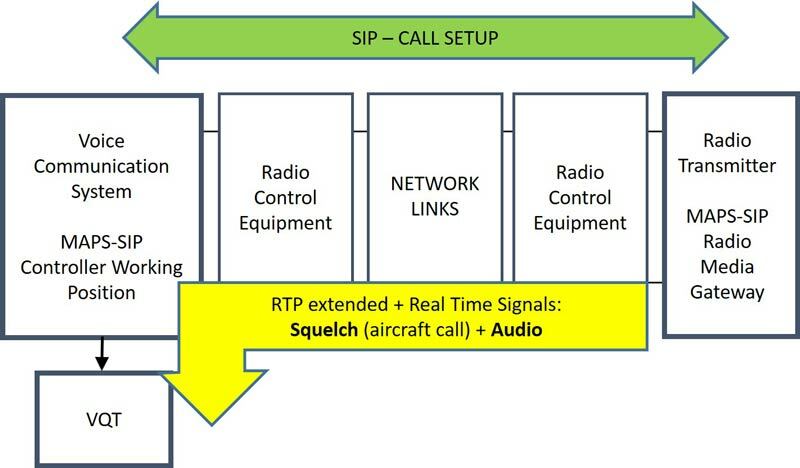 The figure above shows MAPS™ ED137 simulating a call from an aircraft, by sending a voice file over the radio network to an air traffic controller. When there is no voice transmission from the aircraft, only keep-alive packets are sent from radio towards the VCS/CWP endpoint. The PTT keying by a pilot triggers voice transmission towards the ground and keep-alive packets are replaced by audio packets from radio towards the VCS/CWP. The voice traffic is received at the controller side and recorded. With GL’s Voice Quality Testing application, the received file is compared against the original and a standard ITU-based voice quality score is derived. The RTP traffic can also be converted to analog and output to a PC speaker. GL's PacketScan™ - an All-IP Network Monitoring software offers powerful features to capture and monitor live signaling and traffic over IP. It captures, decodes, segregates, monitors and collects statistics on all IP calls, as per EUROCAE ED-138. Ease of viewing Ground-to-Ground calls and Air-to-Ground sessions is possible. 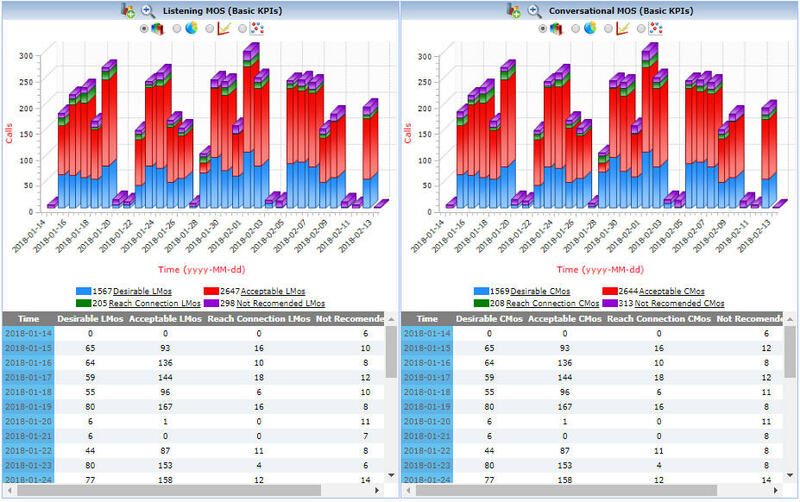 GL’s NetSurveyorWeb™ is a centralized web-based network surveillance system that connects to PacketScan™ probes for displaying Call Details Records (CDRs), measurement results, and network performance statistics. GL offers NetSurveyorWeb™ Lite version, which is a simple web-based client and works at the probe level, as an addon tool to enhance the features of protocol analyzers enhancing the capability to handle larger volume of data, filter for specific calls, build custom statistics and KPIs, automate and graphical analysis features to analyze the call detail records (CDRs) in depth. It is an easy plug-and-play system that collects data, segregates, and provides comprehensive analysis of network health, detailed protocol monitoring with historical data retention up to 9 GB.